“It’s not my first day in New York. It’s not my first day in an aircraft. I did what I had to do. GOOD DAY.” So concluded a tiff between an Aer Lingus pilot caught in a jam and the New York City air traffic controller scolding him for said jam. It’s pretty hilarious. A great tragedy in New York is that the traditional “New York accent” is almost dead. But it still exists in two small corners of the region – the godless Long Island Rail Road, and the city’s blessed air traffic controllers (ATCs). Which is why it’s extra great to listen to one of the ATCs scold the Aer Lingus pilot, referred to here as “Shamrock 104 Heavy,” for getting themselves into a big mess. There’s a lot of pilot-speak in this one, so if you haven’t watched it yet, I’ll help set it up a bit. Usually, to get from New York’s John F. Kennedy airport to Ireland, you zoom off the runway headed south and then immediately swing a left, because that’s where Ireland is. If you’re flying out of, say, Nuuk Airport, then it’s fine. Whatever. Fly around all day wherever you want. You’re not going to hit anything. But flying out of JFK? Well, you’re in for a trip. Everything has to be super coordinated, as New York’s Class B airspace is some of the busiest in the country, if not the world. So you can’t just be like “oh, there’s a storm over here, I’ll go the other way.” Because the other way is Newark Airport, one of New York City’s three main airports. And the other other way is LaGuardia Airport, the other of New York’s three main airports. Not to mention everyone else just flying around on a typical Sunday. Deltas, or whatever. So, the Aer Lingus A330 takes off, immediately sees a bit of weather out the left side, and doesn’t want to fly through it. 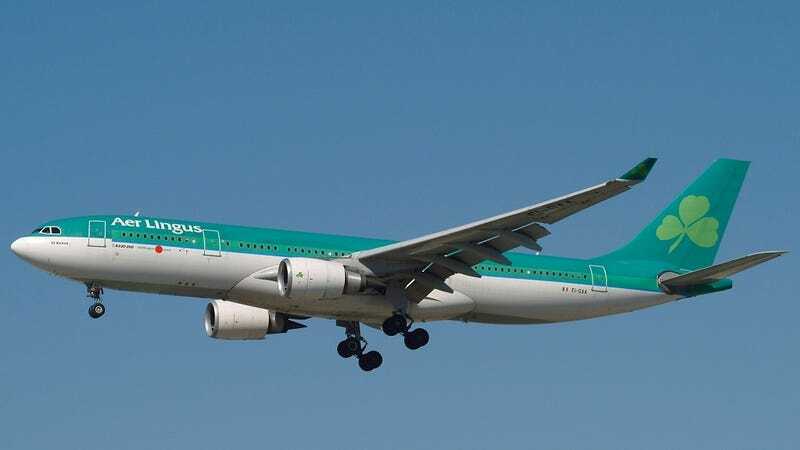 The New York ATC essentially calls the Aer Lingus pilot a wuss, saying that “it’s light. I have six categories of weather here – that is the lightest category.” Just fly on through it, you’ll be fine, essentially. Everyone else was already flying through it. But a pilot’s number one priority is the safety of everyone on board, and if the pilot says it is UNSAFE to fly through some rain, then godammit, it is VERY UNSAFE. So he wasn’t going to fly through some rain for NOTHING. Faced with the dilemma of a plane that refused to go left, but couldn’t really go anywhere else, the ATC immediately just put the Aer Lingus plane in a holding pattern. Holding patterns when you’re landing at JFK are pretty much the standard, but when you’re taking off? Very odd. But since the plane couldn’t really go anywhere else thanks to the weather and the other airports and the other planes, it was stuck doing circles over Coney Island. That presented a dilemma. The passengers on board the Aer Lingus flight hadn’t actually paid hundreds of dollars to fly over Coney Island. They had, in fact, paid to fly to Ireland. So after a bit of circling, the Aer Lingus pilot asked if he could fly the plane in the direction of GREKI, a waypoint just to the northeast of New York City in Connecticut, and on the way to, you know, Ireland. So, more circling it was. Eventually, the Irish plane made it clear that they needed to head towards the GREKI waypoint, probably taking into consideration that the plane also had to use the fuel it had left to cross the entire Atlantic Ocean. So the New York ATC advised them that they had to turn all the way around, and follow the six other planes that were now ahead of them. You would think that would be the end of it. But then the Aer Lingus pilot had some words for the ATC. The flight landed in Dublin an hour late, according to the video description. Big thanks to Jason Rabinowitz for helping me understand all this!